Janus Vandal-Proof Phones (VPP) offers the only full duplex speaker phone solution on the market. 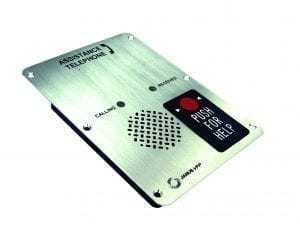 The product range include vandal-resistant emergency telephones for elevators and public indoor areas as well as climate resistant ones for the harshest environments. The VPP T2100 Series of emergency telephones are designed to withstand the rigors of harsh weather and environments, with electronics. The Janus VPP T1250 is ideal for installation in elevators, for areas of rescue or any indoor area requiring emergency telephones. The Janus VPP 900 is a durable, fully-enclosed emergency telephone designed for use in transit systems, tunnels or on railway.